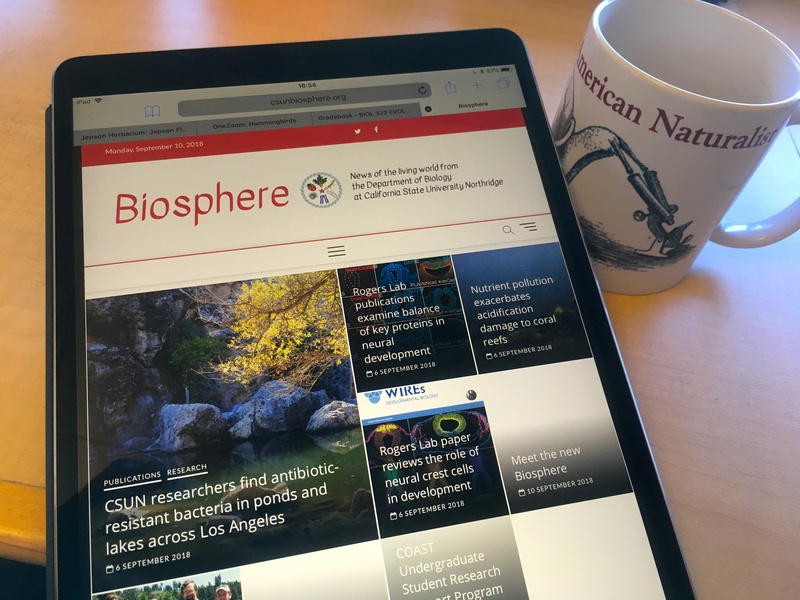 Biosphere, the newsletter for the Department of Biology at California State University Northridge, officially re-launches this week as a departmental news site, at csunbiosphere.org. The new online Biosphere will help spread the word about research, education, and outreach by Biology faculty, staff, and students, and link to new social media feeds on Twitter and Facebook. The move to a stand-alone news website is part of plans to increase the department’s online visibility, raising awareness for prospective graduate students and undergraduate Biology majors. It will also provide current members of the department with a centralized online location for updates about departmental events and opportunities. E-mail distribution of Biosphere will continue, thanks to WordPress newsletter-generation plugins. Faculty, staff, and students can submit news items for the site via a new, responsive online form that provides prompts for specific information about pre-defined news items from upcoming events to new publications and project launches. Back issues of the original Biosphere newsletter will remain available in an archive on the News and Events page of the departmental website, which will eventually incorporate automatically updating headlines from the new Biosphere website.